You may recall that in December I mentioned that our friends at Renewable World were to be featured as part of the BBC Lifeline Appeal. 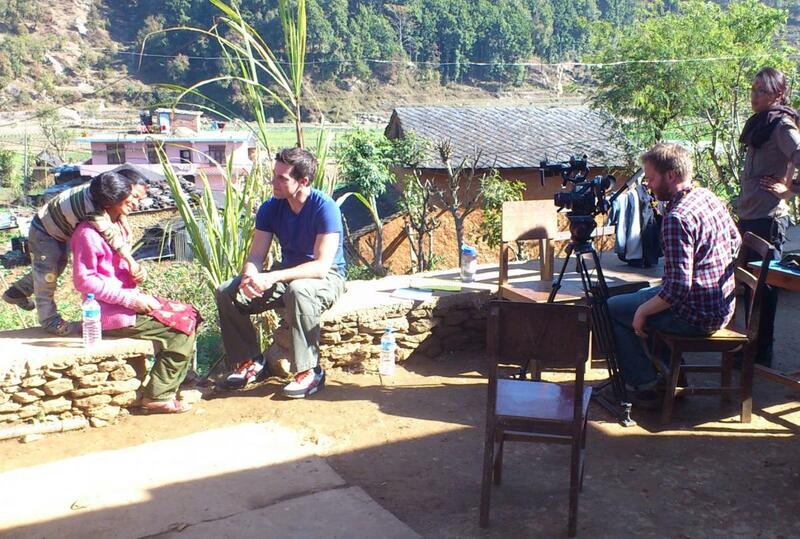 Well, the time has finally come, and the programme about the charity's amazing work in Nepal will be shown on BBC One this Sunday. 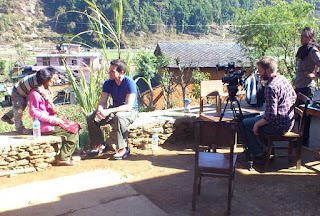 Presenter Gethin Jones travelled to Muralibanjyang in the Dhading district of Nepal, in the foothills of the Himalayan mountains, to see the work that Renewable World is doing, and to meet with the people for whom that work is making a real difference. Renewable World installed a hydraulic ram pump, that sends water from streams on the valley floor up to the tiers where the people of Muralibanjyang live and work. One remarkable woman I met yesterday, Sumina - a mother of three, with a husband who has been very poorly, explained the effect the water pump has had on her family's life. Having water pumped to fields and her home, rather than spending a huge amount of time and effort collecting it means so much. She can provide a nutritious diet for her children. She can sell some of her produce in the local market, which in turn means she can afford to send the children to school (instead of them helping in the fields all day). And, she can grow her vegetables ALL year round. The approach that Renewable World take is simple, yet effective; use exosting, cheap technology and install it at the point where it can best help rural populations to make real, palpable improvements to their lives. When you don't have to spend your whole day fetching water, you can do so much more with it. Renewable World is a charity that we have supported enthusiastically here at The Pier for a while now, and it's great to see their work getting wider exposure. For more details, check out the Facebook page, or go direct to the Renewable World Lifeline Appeal page on their website. The BBC Lifeline Appeal, featuring Renewable World, will be shown on BBC at 4:20 this Sunday, 17th February. A wonderful example, Rob, of how something that we take for granted day to day can have such a large impact on someone else's life. We would not associate a water pump with making a family's life manageable.